In the old days, pregnant women would eat miyeok-guk for about a month after giving birth, a tradition still prevalent today, but not as widespread as it once was. Seaweed is high in iodine and calcium, which are thought to be beneficial for uterine contraction and milk production. Eating miyeok-guk on one's birthday is seen as a way to remind children not to forget the pain of childbirth and to appreciate the care given to them by their mother. 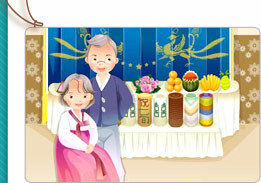 In many ways, the birthday culture of Korea has become similar to that of the West. Birthday cards and gifts are common and cakes are prepared with candles numbering the person’s age. One main difference though is that in some cases, although less these days, people celebrate their birthdays according to the lunar calendar (as opposed to the Gregorian calendar). However, the Western dates (on the lunar calendar) tend to differ every year. Some people celebrate their birthday according to both Western and lunar calendars while some choose to celebrate their Western birthday with friends and their lunar birthday with family. Milestone birthdays like dol (a child's first birthday), hwangap (60th birthday), and chilsun (70th birthday) are usually celebrated with a feast or large party. Dol is celebrated a year after a child’s birth. In the past, when food was scarce and infant mortality was high, it was considered a blessing and a true sign of fortune that a child survived to his/her first birthday. In celebration, rice cakes, fruit, and food are prepared and shared with the people of the village in appreciation of the care and blessing of Granny Samsin, the goddess that (according to folk religion) takes care of a child’s birth, life, and health. This custom has been handed down for generations, making doljanchi – literally meaning "feast to celebrate the first birthday" – an important event in Korea. The event is usually held in a hotel banquet room or restaurant. The highlight of this event is a ritual called doljabi, in which the child is placed in front of a table with rice, money, a book, and string, and is prompted to pick an object. People will then make predictions about the child’s talents and future based on the object that they grab. Food is shared with family members, relatives, and neighbors, with the belief that the more is shared, the more blessings will be returned. The menu for dol parties may vary, but one staple found at all dol parties is baekseolgi - rice cake made of rice flour dough. Some households also make special rice cakes for their son/daughter until they grow up to be 10 years of age, since the white color of the flour is believed to ward off evil spirits and keep the child safe. It is customary to take elaborate pictures of the child on their first birthday. In contrast to the simple portrait shot taken in the past, most children have their own mini photo shoot, wearing different clothes in different settings. Photos are typically taken in a professional photo studio and kept in an album or an ornate picture frame. Just a few decades ago, the average Korean life expectancy was only around 50 or 60 (see footnote). So when someone turned hwangap, or sixty years of age, a big feast was held in the village in the person's honor. With advances in medical science and a higher standard of living, the average Korean life expectancy is now 80 or above. Some people even say that ninety is the new hwangap. Due to such changes, it has become less common to see people celebrating their sixtieth birthdays. Unlike big feasts to celebrate longevity in the past, it is more common for people turning sixty to go on a trip overseas, take silver wedding photos, or celebrate the occasion in a different way. While hwangap celebrations are becoming more simple, feasts to celebrate chilsun (seventieth birthday) or palsun (eightieth birthday) have become more important and more elaborated. Just as in the traditional sixtieth birthday party, families gather in a big restaurant, wear hanbok, and celebrate the occasion with a table piled high with fruits, rice cakes, and traditional cookies. Recently, more and more people are celebrating their milestone birthdays in alternative ways such as donating money to those in need or contributing to local scholarship programs. In Korea, a child is considered to be one year old as soon as he/she is born. They then turn two years old the following year. When referring to the age system used by the rest of the world (mathematical), in which a child is one year old only after 12 months have passed since their birth, the term man (meaning "full") is used.